Ma Jianzhong for reviewing prior to publication. In the gentle hills and river valleys of southern Yunnan lies the Xishuangbanna Biosphere Reserve. This tropical area is populated by the Dai and other indigenous groups who regard the forest as the most sacred part of their environment, for it is the source of water and food. Thirteen ethnic minority groups live in the Xishuangbanna area, of which the Dai are the largest, at one-third of the population. They rely primarily on paddy rice for subsistence, and therefore value the forest primarily as a water source, though they also harvest vegetables and medicinal plants from the forest. Social rules are in place to take care of the forest, including the cultivation of wood for fuel so as not to use forest wood. Other groups in Xishuangbanna include the Hani, Yi, Bulang, Lahu, Yao, Jinuo, Wa, Jinpo, Miao and Kemu, who live in the mountainous forests and rely more directly on the forest for hunting, gathering and semi-wild cultivation. In this way, the subsistence of the various communities is complementary and ensures the forest is not overly taxed. All ethnic groups in Xishuangbanna see the forest as the giver of life, though they conceive the relationships differently. According to the Dai tradition, the environment consists of five major elements – forest, water, land, food and man — with each element leading to the next: the forest provides water, which feeds the land, which produces food, which sustains man. The Hani identify their sacred forests by functions such as the Earth-mother sacred forest, water source forest and cemetery forest. Historically, when a village was built, a first priority was to locate the village’s sacred forest (known as Nong in Dai and Bulang languages), a patch of forest usually found on a nearby hill or slope, known as a Holy Hill. This was seen as the natural counterpart of each human-made settlement. Each village has a sacred forest where the people believe the gods reside along with their animal companions and the spirits of ancestors. Because the forest is the “garden” of the gods, people are not allowed to harm the forest in any way, including hunting, gathering or cutting. Villages are punished for violations through floods, fires, storms or insects. Like many indigenous groups, the Dai incorporated Buddhism into their already-existing traditions. These faiths are similar in their reverence for the natural world and recognition of the importance of plant diversity. So, in addition to Holy Hills associated with each village, Buddhist temples in the Xishuangbanna Biosphere Reserve each have their own temple forest. These are generally planted when the temple is built, or are saved when the surrounding forest is cut to make way for the temple and associated farming. These sacred groves ensure that there will be water for irrigation, bathing and drinking. They also function as botanical gardens by protecting rare plants — in part because Buddhism requires that temples have specific plants, like those used to carve Sutras, those which provide oil from seeds used to illuminate, and those which produce fruits used as offerings and food for monks. Many plants that grow in villages originated from temple gardens. In more remote Dai areas, there are also individual trees associated with ceremonies and rituals. In the indigenous tradition, trees that grew naturally are picked to be the site of collective rituals, while Buddhist trees are deliberately planted and used for individual meditation and prayer. Scientists are now documenting the impact of traditional religious practices on biodiversity and finding that long before environmental sciences came into being, land-based spiritual practitioners were preserving rare species of plants and animals. Xishuangbanna now contains 18% of China’s flora species and 20% of its fauna species despite the fact that its land area comprises only 0.2% of the total land of China, making it the most biodiverse region in China. Part of the reason for this is the care given to the land as mandated by religious beliefs and associated cultural values. Forests were marked off-limits and farming systems were developed that regulate access to resources to ensure that what is taken from the land is allowed to regenerate. This knowledge was incorporated into cultural memory and it is knowledge that can now contribute to scientific conservation. Local researchers have concluded that conservation principles followed voluntarily out of spiritual conviction are far more effective than those imposed by a government. Clearly, this local lesson has global implications. While Xishuangbanna is far richer in flora and fauna than most places, the pressures of population and poverty are taking their toll on the area. Because of China’s population expansion, people have moved from traditional subsistence agriculture to larger industrial farms producing rubber, tea and tropical fruits. The 1970s saw large growth in the rubber industry, which led to a reduction in natural tropical forests from 60% of the region in the 1950s to 30% in 1980, thus causing extensive species loss and soil erosion. Before 1958, there were over 1,000 sacred forests in Xishuangbanna, but currently there are just 250 — a 75% decrease. Although almost every existing village still has a Holy Hill, many of them have lost their pristine quality. Some temples forests and Holy Hills that were decimated began to be re-built in the 1980s, but it was too late to save many species. In spite of these losses, however, sacred forests of Xishuangbanna are much richer than newly designated nature preserves. Recognizing that much biodiversity still existed in the Xishuangbanna area, the Chinese government made it a provincial reserve in 1958 and a national reserve in 1981. In 1993, the United Nations Educational, Scientific, and Cultural Organization (UNESCO) included the reserve in its Man and Biosphere (MAB) Nature Reserve Network. The MAB program initiates pilot projects with villages to develop sustainable models for economic development that do not destroy natural resources. Programs like this can look to the system of sacred forests for an example of conservation already tested and maintained over generations. While rules of behavior in the forests were traditionally enforced by the village headman or Bimo, today’s sacred forests are jointly governed by the reserve and village leaders using participatory management approaches. The Association of Religious Plant Conservation was founded to document traditional knowledge and conservation practices. Based in Xishuangbanna’s primary temple, the Association functions as a school to train young people, monks, clerics, farmers and local government officials in spiritually-informed forest management practices. The Meili or Kawagebo Snow Mountain Range is a sacred cultural landscape consisting of the Kawagebo Peak (the highest mountain in Yunnan, rising 22,241 feet above sea level), along with 13 other mountains and associated forests. Located in northwest Yunnan Province along the border with Tibet, the Meili Mountain Range comprises rugged terrain with high mountains, deep gorges and the convergence of four rivers. One waterfall cascades 3,281 feet down the southern side of Kawagebo Peak. The Meili Range is revered in the Mizong sect of Tibetan Buddhism (known as the sacred Khabadkapo in the Tibetan language) and by Bon, the local polytheistic religion. Kawagebo Peak (which is also the local name for the whole mountain range) is the namesake and the home of the Tibetan warrior god, and is one of the eight most important sacred mountains on the Tibetan Plateau. Other Tibetan gods also inhabit the area, making it a central sacred landscape for both the local community and Tibetan Buddhists. It is the practice of Mizong followers to make a pilgrimage, coming from throughout Yunnan Province and other parts of China, to worship, offer sacrifices to the mountain and collect medicinal plants. Pilgrims also participate in Zhuanjing, a month-long ritual circumambulation around the base of the sacred mountain. Seventeen ethnic groups live in the Hengduan Mountain area, and much of the population is below the poverty line. Residents rely on wood for cooking, heating and construction, which taxes the environment more as the population grows. As in Xishuangbanna, the 1970s saw widespread deforestation causing loss of habitat and wildlife, soil erosion and landslides. Now, commercial logging bans are in place, which protect forests but appear to weaken the economy. Demand for water has also increased. When human needs clash with a desire for environmental preservation, the only land spared may be the areas that are considered sacred. 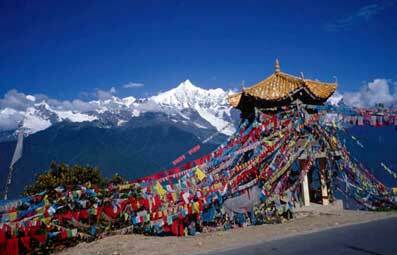 The mountains of northwest Yunnan are natural-cultural complexes made up of the individual mountains with associated temples or forests. Often local groups each care for their own forest and come together regionally to take responsibility for a sacred mountain. The traditional system of land classification divided the mountain range and its valleys into land usage zones. In one study of the Yubeng valley area, undertaken by local researchers and the Nature Conservancy, there were four zones which had been in place for 700 years: (1) “pure land” where female deities reside and humans are not allowed; (2) sacred land where human use is strictly governed; (3) no hunting land; and (4) open land for all uses. These ancient guidelines for land use have led to remarkable biodiversity. The Meili area has seven climatic zones containing numerous endangered plants and fungi, and over 75% of Tibetan medicinal herbs. It is also the habitat for endangered wildlife, such as snow and clouded leopards, Asiatic black bears and red pandas. The traditional guidelines ensure activities like hunting and logging are limited in scope, and they forbid climbing on the mountain, as this is thought to pollute the sacred landscape. At least two climbing expeditions have been cancelled in the last few years due to religious objections. The top of Kawagebo Peak has still never been touched by humans due to its vertical cliffs, treacherous weather and high spiritual status. Traditional land zones have to some extent been codified by modern government regulations, distinguishing between community-use forests and state-controlled public forests. Unlike many Holy Hills, found in remote areas, sacred mountains are often well known tourist destinations located on state-owned forest lands. The Meili area has seen rapid growth in tourism since it was opened to travelers eight years ago. Overnight stays went from 17,000 visitors in 1996 to 650,000 in 2003. Unfortunately, the nature of tourism development in the area may not be conducive to cultural survival. Tourism operations are owned by outside companies so revenue does not stay in the community, and tourists do not receive environmental or cultural education, so they are usually ignorant of the fragility of the physical and social landscape through which they travel. Further, the government agencies responsible for tourism and development do not often coordinate with those responsible for environmental regulation, so development proceeds without a long-term strategic plan. While tourism has the potential to encourage residents to take care of the natural sites that attract tourists, the way tourism is developing around the Meili Range hastens commercial development without consideration of the strain on either the natural world or the cultural landscape. The Meili Mountain Range is included in the Three Parallel Rivers World Heritage site, but is not an established protected area like the Xishuangbanna Biosphere Reserve. The Nature Conservancy is working with the county government to make it into an official Nature Reserve and is drafting a management plan that would give one agency the authority to oversee all activities that impact the Meili Mountain Range, developing a sustainability plan to protect resources and reduce the threats of mass tourism. In 1983, local regulations codified traditional rules, which forbade hunting and harvesting in specific zones, but this only applies to areas designated for community use; other government land is designated for public use and so access is controlled by the state. The Chinese government has established twelve other nature reserves in the northwest Yunnan area since the 1960s, and in 1998 it launched the National Natural Forest Protection Project with the goal of stopping all commercial logging and promoting environmental rehabilitation, with northwest Yunnan as a primary focus. Difficulties with this include the fact that sacred places not located in mountain ranges may be overlooked and that eliminating logging without developing other income-generating activities does not help the local people. Therefore, the Nature Conservancy is working to develop more sustainable practices including the harvest of non-timber forest products, animal husbandry and exchange programs with managers of other culturally significant reserves. The Yi and Miao people inhabit a plateau area in central-western Yunnan, at altitudes ranging from 5,200 to 7,500 feet, which was designated a provincial nature reserve in 1993. Their communities, known as Zyin and Zunging, have managed their water resources and forests for centuries out of spiritual conviction, which has resulted in similarly significant biodiversity as is found in other parts of Yunnan. The evergreen forest on the plateau has been an important meeting point of indigenous Yi culture, Buddhism and other Chinese cultures. Like in other parts of Yunnan, water sources are taken very seriously, because it is necessary to irrigate rice paddies and upland terraces, as well as to provide for humans and animals. The people believe that the forest is one of only two sources of water — the other is in Heaven — and so forests must be guarded carefully. Many Chinese cultures worship dragons and believe they control rain and water. Two hundred year-old stone tablets have been found in the Zixishan region on which are inscribed the rules for preservation of the forests. These texts describe the relationship between the dragons and the forest — like mythic versions of modern environmental regulations. Zixi Mountain is seen as the backbone of a mythical dragon which provides water to the people, as long as the surrounding forest is cared for. When drought comes, the people hold a dragon worship ceremony. As with other areas in Yunnan, increased population and development represent the main threats to the Zixishan area. The 5,000 residents living inside the nature reserve continue to rely on its natural resources, while the growing population of nearby Cuxiong City brings more traffic and growing demand for resources. The various reserves and sacred landscapes in Yunnan are important in their own right, but they also serve as models for the rest of the world. Research done there stands out in sacred land studies because the quantitative data being gathered in sacred areas conclusively documents the rich biodiversity that has resulted from age-old spiritual traditions. Work is also being done on participatory conservation practices, in which visiting scientists listen to and draw on the knowledge of local residents. Then, both sides work together to find sustainable ways to live off the land, acknowledging the need for income generation for growing communities, while receiving local input on conservation practices. Yunnan shares with many other indigenous areas the challenges of poverty, population growth, resource extraction, mass tourism, and the need to preserve cultural identity as “minority” groups within larger nations. Any thoughtful approach to meeting these challenges must take as its starting point the centuries-old ways of life that integrate complex spiritual beliefs and practices with sustainable use of land and water. These traditions must be preserved. This can be difficult, because indigenous systems of caretaking are usually predicated on small populations and large areas of forest. When the pressures of population increase and trigger greater consumption of resources, it is not always a simple matter to apply indigenous knowledge. Joint management approaches, based on cooperation between government agencies and native political and spiritual leaders, need to be developed. Establishing protected reserves is a start, but these must be managed in cooperation with the local community. Otherwise, regulations may not be enforceable and valuable cultural knowledge may be lost. Tourism, if promoted without violating sacred areas, can be a boon to the economy and provide incentives for preservation, but it must be run through the community so that revenue stays there and impacts are controlled. The example of the Association of Religious Plant Conservation shows how local knowledge can be passed on within the community and to conservation professionals. In the case of Yunnan, sacred forests function like “green islands” in landscapes that have been otherwise taken over by farmland or resource extraction. So, when nature reserves are established, species from sacred landscapes can provide a gene pool for rehabilitating environments and introducing species that have been lost elsewhere. International programs like UNESCO’s Man and Biosphere Reserve and World Heritage, and conferences like the 2005 Tokyo symposium “Conserving Cultural and Biological Diversity: The Role of Sacred Natural Sites and Cultural Landscapes” can provide technical assistance, visibility and a network within which local leaders and protected area managers can study other examples, and meet and learn from each other. They also bring recognition to well-managed sacred landscapes that may provide incentives for governments to support indigenous communities. If you visit Yunnan Province, please take care to learn and respect the ethics of ecotourism. A good place to start is Ethics for Visiting Sacred Sites. Nature Conservancy. “Places We Protect: Meili Snow Mountain.” The Nature Conservancy. Nature Conservancy. “Places We Protect: Yunnan Forests.” The Nature Conservancy. United Nations Educational, Scientific, and Cultural Organization. “Three Parallel Rivers of Yunnan Protected Areas.” UNESCO World Heritage Centre. United Nations Educational, Scientific, and Cultural Organization. 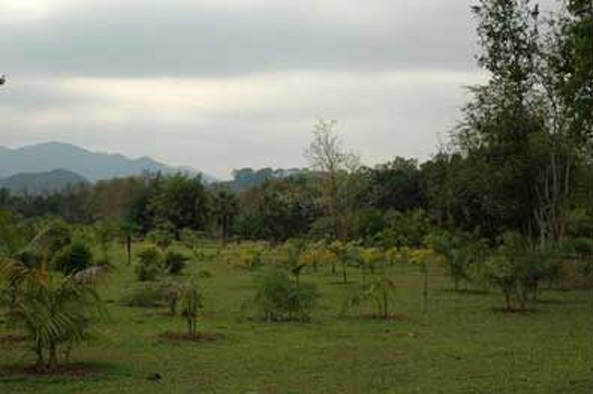 “Xishuangbanna.” MAB Biosphere Reserves Directory.